Sit. Adjust the knee pads so that the knees just barely fit beneath them. Once the knees are in position underneath the pads, place the balls of the feet on the feet plate or foot plates with the heels hanging down over the edge(s). Inhale, press with the feet (plantar flexion) until the calves are fully flexed, and exhale throughout the (positive) motion. Lower until the heels are lower than the feet plate, (a deep stretch will be felt in the calves), and inhale throughout the (negative) motion. 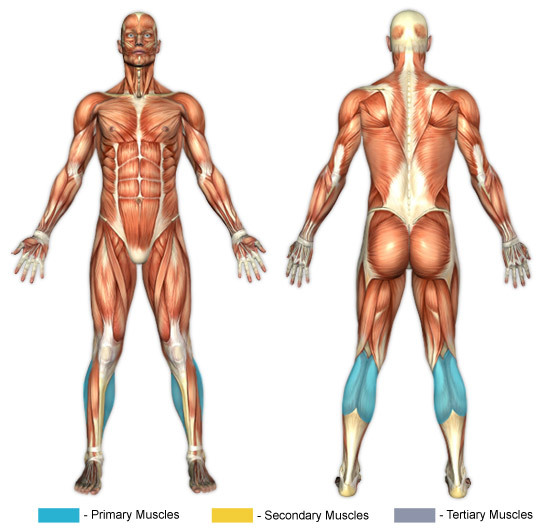 The calves (Triceps Surae) consist of primarily three muscles that come from two major masses of muscle. The gastrocnemius, which has two heads - a medial and a lateral - and the soleus. Seated calf raises put specific focus on the soleus muscles of the calves. The gastrocnemius muscles are almost entirely relaxed when the knees are bent. If building calf mass is the goal, then lifting with heavy weights is almost unequivocally required. The calves are usually considered to be the most arduous muscle of the body to develop because they are accustomed to being worked constantly by the mere act of ambulating from place to place. The calves are capable of a notably high quantity of work. Getting results in calf strength, definition, or mass will, for most, require mental fortitude and strong, unwavering volition. Likewise, if building calf endurance is the goal, then lifting with high repetitions is almost absolutely required. The same reason as above applies. In theory, the feet can be positioned in different ways to change the focus of stress on the calf muscles. By pointing the feet outwards it is possible to isolate the inner calf (medial gastrocnemius) and, conversely, by pointing the feet inwards it is possible to isolate the outer calf (lateral gastrocnemius). For most, it will take practice to achieve this result, even with proper foot placement. Separating the stress put on the gastrocnemius from the soleus is much easier to accomplish. (e.g., Standing calf raises will work the gastrocnemius more, while seated calf raises will work the soleus more).